Mimsy: Does Hurricane Harvey support socialism in Texas? Let Texans, and anyone else who wants to help, opt out of the crazy regulations that literally block people from helping. So many times in past disasters we have seen people try to provide food, boats and other transportation, building and emergency supplies, and the labor of their own hands, only to be told that it is forbidden by EPA rules or Department of Labor regulations or that they need to apply for an expensive use permit that the government agency in charge will take days, weeks, and even months to issue. The Democratic Mayor of Houston couldn’t come up with a plan to evacuate Houston, according to reports. The federal government is still managing Katrina twelve years later. Let people get back on their feet freely, and let people help freely, and we will recover from Harvey in months rather than years. We know this from past disasters from before the federal government sucked up all resources and chased off anyone trying to help outside of big agencies and organizations that specialize in navigating federal regulations. We know that the free market—letting individuals act freely to help however they can afford—works to recover from disasters far more quickly than federal bureaucrats do. If the left really is offering to let Texans opt out of bungling federal assistance and help themselves, and let the rest of the United States opt out of bungling federal assistance to help Texas voluntarily, then I suspect they’ll find Texas taking that deal so fast their Che poster will flip to the wall in the winds of freedom. If, on the other hand, they’re asking Texans to forego the watered-down bungled benefits while still facing jail time for not paying into the corrupt and incompetent system, then this is just the standard ghoulish left, never letting a crisis go to waste when it could be used to increase socialism at the expense of individuals. We’ve taken your money, they say. And now that you need some back, you can’t have it unless you promise to support socialism. Even as I was finishing this reply, the left has started to call Texas Republicans hypocrites for opposing the pork-laden bill that was supposed to be only emergency relief for Hurricane Sandy victims. They are desperately casting about for a way to use this disaster for political gain. Stuffing an emergency relief bill with non-relief spending and non-emergency spending and then complaining that other people don’t care about helping disaster victims is, in my opinion, a better place to look if you want to find hypocrisy. In response to Texas and Round Rock: News from Texas, and especially Round Rock/Austin. But only at the edge of the storm, as I write this. And it may well come out, after the two-day-rule—which hasn’t even started its countdown yet—that the news is misreporting what the mayor actually said. That is always the way to bet before the two-day rule, and often after it. Where in the New Testament does Jesus tell us to force our neighbor at gunpoint to give to the poor? Does it matter that the Pledge of Allegiance was written by a socialist? John Hinderaker muses about the “enduring popularity of fraud” in politics. Who is a liberal follows directly from applying what one learns in the first grade. 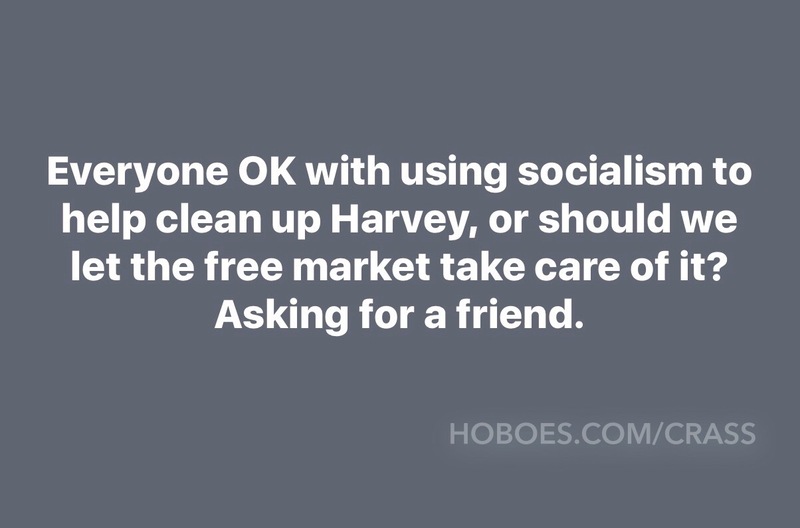 Does Hurricane Harvey support socialism in Texas? last modified October 15th, 2017.